Meet every step of the planning cycle without the confusion and hours of writing each week. This toolkit will help educators keep it simple with all documentation essentials covered consistently and efficiently. Not just templates – each pack is accompanied with information and tips on how to best use the templates efficiently and meaningfully! Suitable for large Teams and Leaders in early learning centre environments as well as Family Day Care Coordinators and Educators. PDF format with text and photo editable fields. HOW WILL THIS TOOLKIT MAKE PLANNING EASIER? 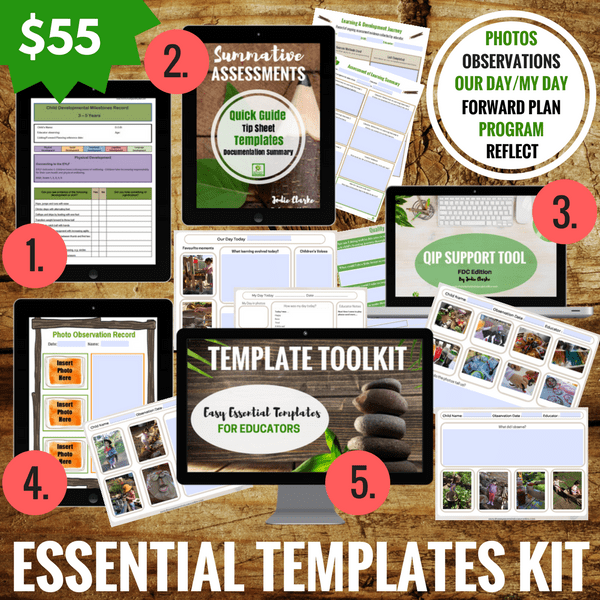 This Toolkit of Essential Templates is designed specifically for busy,time poor or overwhelmed educators who want to provide high quality documentation, programs and parent communication tools for their early years service but do not want to waste valuable time that could be better spent interacting with the children in their care! Easy to use PDF format with text fields for you to enter own information as needed. One click to add photos to the templates from your own computer files. Save on printing costs and paper waste by keeping in digital portfolios in the cloud or emailing to parents. Meet every step of the planning cycle without the confusion and hours of writing each week. 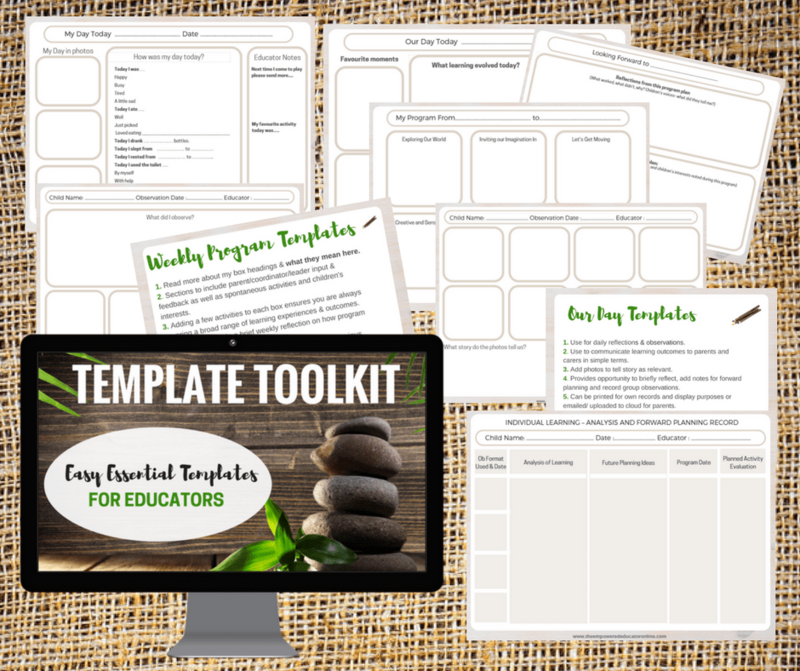 This Template Toolkit will help educators keep it simple with all the essentials covered consistently and efficiently. Not just templates – each pack is accompanied with information on how to best use the templates efficiently and meaningfully! Suitable for large Teams and Leaders in early learning centre environments as well as Family Day Care Coordinators and Educators. A mini e-book that takes educators on a brief overview of the planning cycle, breaking down the steps involved and explaining the specific templates that would work best for each step. 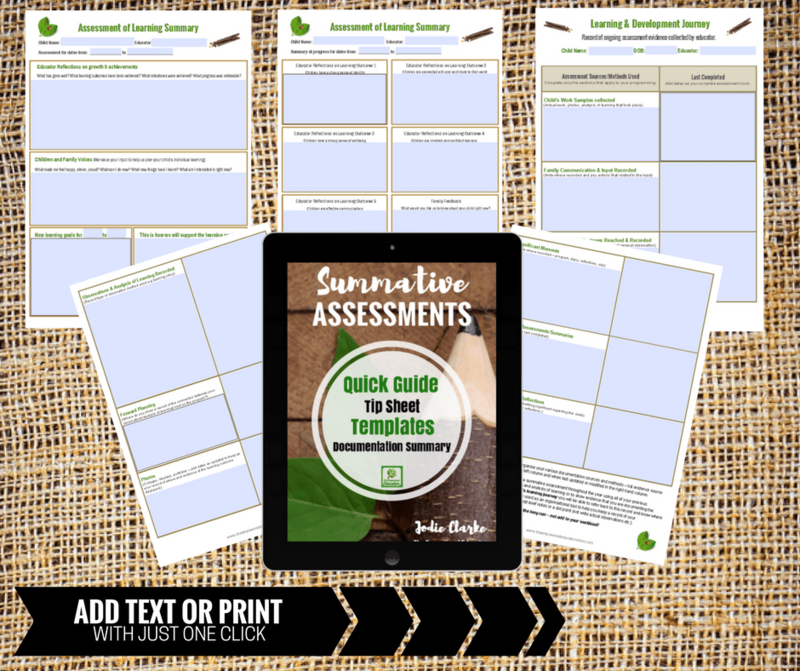 Help to make writing summative assessments less time consuming and meaningful. Click and insert photo fields to insert photos from the children’s play on many of the templates. 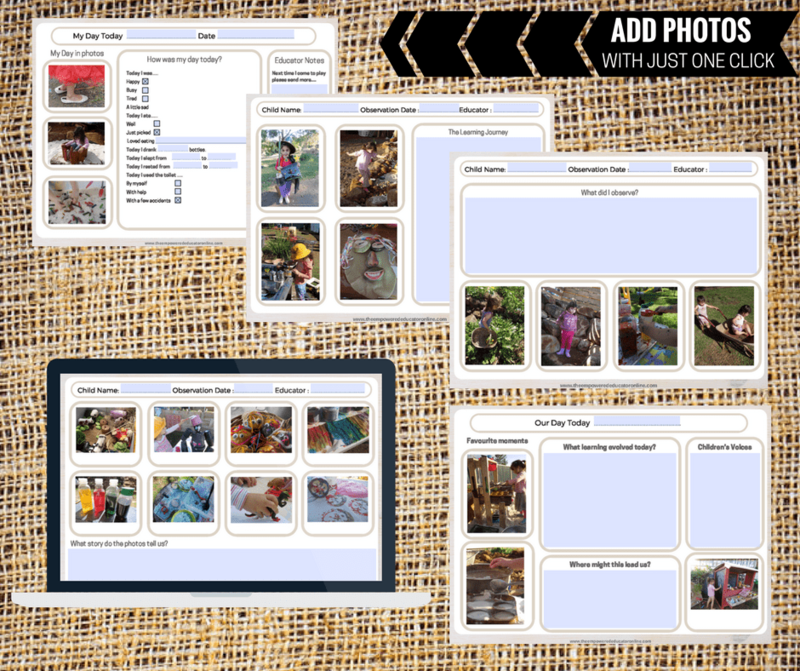 An easy and budget friendly way to keep programming, documentation and communication digital to share with family, coordinators, leaders and others if required. The opportunity to go old school and print and write if preferred. Over 50 fillable PDF Templates that cover parent communication, learning stories, activity planning, observations, reflection and forward planning, summative assessments, linking, quality improvement planning and more. 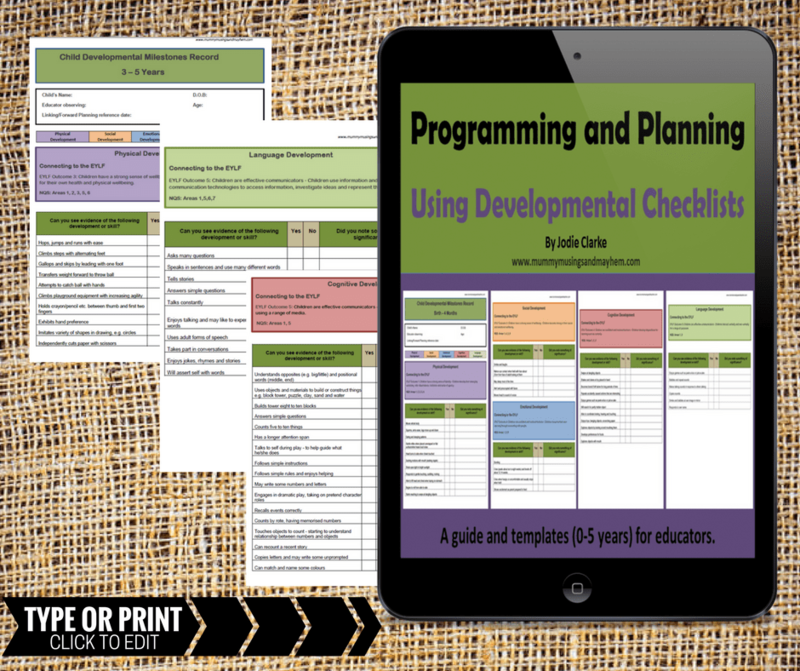 Developmental checklists to accompany observations & learning stories – editable with Word or printable with the PDF version. Valuable time back because you won’t need to design or edit new templates or print and paste photos. What do you receive after purchase? You will receive a confirmation email with an official receipt and links to download the following 5 resource packs immediately after payment is completed (Click on the images below for more information about what is included in each of the packs). 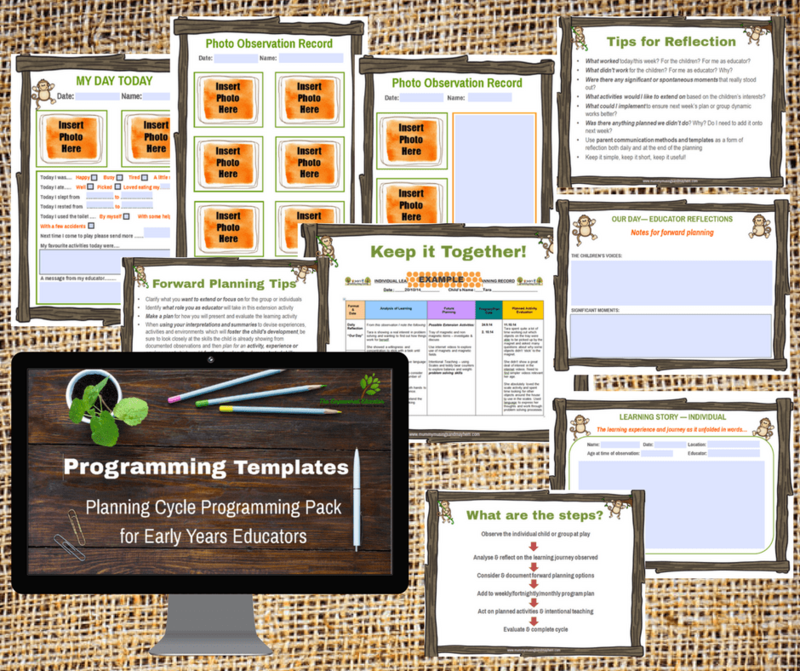 Or you can watch the quick video below for a walkthrough of all templates and guides included in the toolkit. 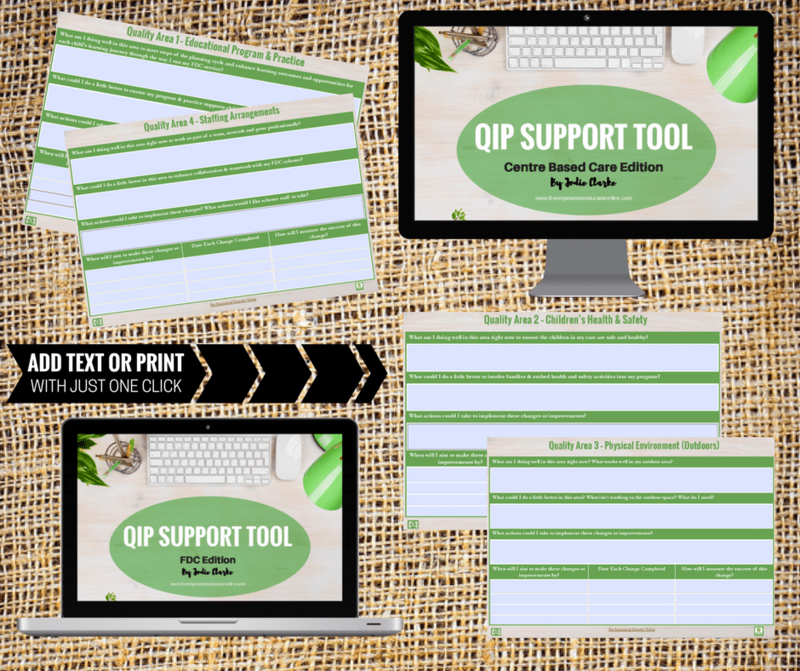 Resources bundled together in a zipped folder for quick and easy downloading. Tap and type into each template in formatted sections or print and write – whatever is easiest for you! Guidance to put a system in place that won’t overwhelm! 3. Child Developmental Checklists for ages 6 weeks – 6 years. Both FDC Version & Centre Based Care Version included in Toolkit. A 10 page tool covering the 7 Quality Areas to help educators assess and identify goals and tasks as you think of them and guide you towards completing an ongoing Quality Improvement Plan. To be used it as a guide to helping all educators understand and reflect upon their current practice and to help them determine where changes or improvements might be made in each of the quality areas and how those changes or improvements can be implemented. This tool will show evidence of an ongoing process of self assessment and reflection for you to discuss with your leader, coordinator or team and help you to provide valuable input into the service’s formal QIP document. All the hard work is already done for you, get back to what you love and do well – playing and interacting with the children in your care! The templates and bonus information in the guides come together to form a comprehensive yet easy to understand system that will support you to clarify and complete each step of the planning cycle efficiently and effectively – without the usual stress and last minute panic.